New Wave Domesticity: simple baby things. someone wonderful in my life is having a baby in a few weeks and i really wanted to make her a simple little token of appriciation and support. i am not really a baby person. i don't know much about what a new mom needs, but decided on a really simple, but cute handmade bib. this whole project probably costs about $2 (depending on your fabric of course) or so and takes maybe a half hour, but i think this makes a really sweet gift. i used a great pattern from jill and just cut out one layer of flannel (i had this really cute owl fabric that i got on sale at joanns that had been mulling around my craft room for months, so i was excited to use it) and one out of a clean recycled terrycloth towel. then you just need to iron and sew the two parts together (no need to make super perfect edges because you will be covering this stitch with bias)...you might not even need that step, but i found having the two peices already sewn made adding the bias tape easier. next, you just find a corodinating bias tape...i used 1/2", but you can use whatever size you think looks best...and sew it around all the edges and inside the neckline. 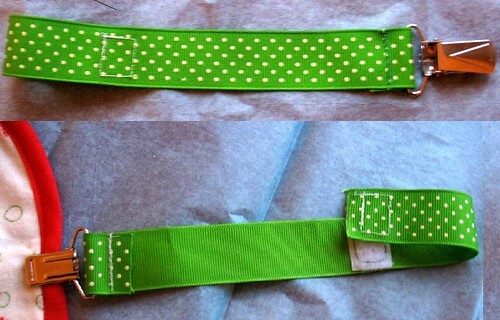 you could add snaps for a fastener at the top, but i just used some simple velcro squares. and voila! 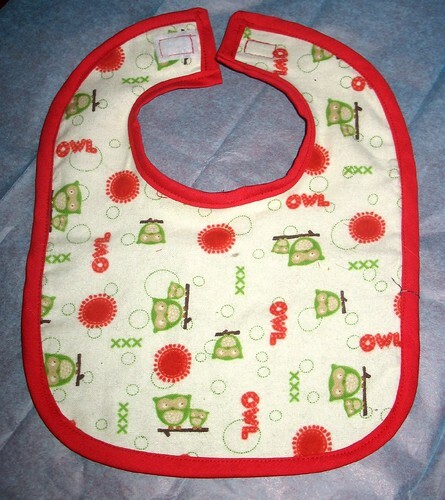 easy peasy baby bib that is both cute and easy to throw in the washer! i also made a little pacifier holder for her. it is basically just a some cute ribbon and a bit of velcro stitched at one end to form a loop to hold the pasifier and then a little clip (i got a 2 pack of suspender clips from joanns, but you could also use little name badge clips from an office supply store) sewn on to the other end that clips to the baby's shirt. again, i know very little about babies, but my coworker tells me this is a very valuable little tool to keep pacifers off the floor. that is so cute!!! i really need to learn how to sew!